Shopping in the shadow of Mt. Ranier! 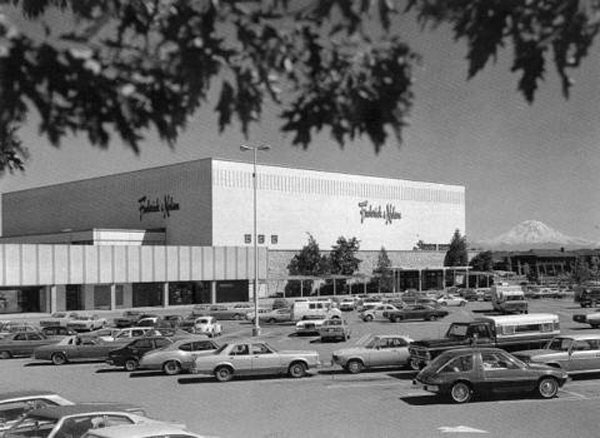 Here's a wonderful exterior shot of Southcenter Mall (now the "Westfield Shoppingtown" Southcenter), with Mt. Ranier looming majestically on the southern horizon. Nice view here, too, of the Frederick & Nelson anchor store (now a Sears) from the parking lot. Many thanks to Paul, in New York City, for this great photo! I really appreciate the submission. Westfield has officially dropped their insistence on the use of "Shoppingtown" on US centers. You'll see on the mall's official site that it's just "Westfield Southcenter" now. Some Shoppingtown signage remains at Westfield centers in the US, but they've given up on continuing to force the use of the moniker that US shoppers refused to embrace. GREAT ... that SHOPPINGTOWN was a mouthful and it seemed to take so much away from the actual name of the mall in the 1st place. The AMC Pacer in the front of the parking lot really makes this a great photo! Glad to hear they dropped shoppingtown. 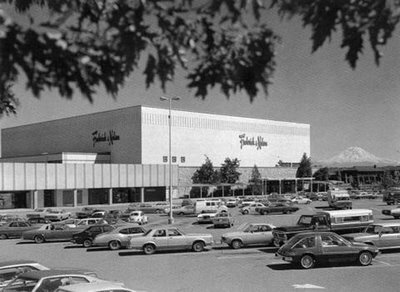 I'll always remember it as simply Southcenter mall. I had no clue they even changed the name of the mall. It will ALWAYS be Southcenter mall to me. When I was 8, I got my ears pierced at J.C. Penney and met JP Patches and Gertrude there the same day. Last year there were several articles written about Westfield's dumping of "Shoppingtown". Here's one that's still online: Westfield mall to ditch 'Shoppingtown' moniker. If you squint you will see the original Double Tree Hotel in the brown buildings. It is located to the far right. It's Southcenter. Westfield can call it what it wants...the rest of the universe will still refer to it as "Southcenter." Neat set of old photos of the place.